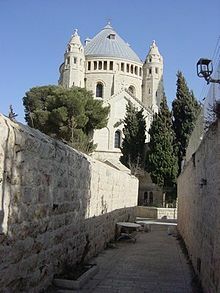 Abbey of the Dormition is an abbey and the name of a Benedictine community in Jerusalem on Mt. Zion just outside the walls of the Old City near the Zion Gate. Between 1998 and 2006 the community was known as the Abbey of Hagia Maria Sion, in reference to the Basilica of Hagia Sion that stood on this spot during the Byzantine period, but it resumed the original name during the 2006 celebrations of the monastery's centenary. Hagia Maria Sion is now the name of the foundation supporting the abbey's buildings, community and academic work. The Byzantine basilica Hagia Sion was built under John II, Bishop of Jerusalem in the early 5th century. Relics attributed to Saint Stephen were transferred to the church on 26 December 415. The church is shown in the 6th-century Madaba Map. It was destroyed in the 614 siege of Jerusalem by Sasanian king Khosrau II. Its foundations were recovered in 1899, when architect and building's manager of the Diocese of Cologne, Heinrich Renard [de] (1868–1928), investigated the site. Connected with this is the thesis of Bargil Pixner of a pre-Crusader Church of Zion. A monastic order known as the Abbey of Our Lady of Mount Zion was established at the site in the 12th century, with a church built on the ruins of the earlier demolished Byzantine church. The 12th century church was again destroyed in the 13th century, and the monks moved to Sicily. The order was eventually absorbed into the Jesuits in 1617 (the Congregation of Notre-Dame de Sion is an unrelated monastic order founded in 1843). The order was chosen as the namesake of the "Priory of Sion hoax" created by French esotericist Pierre Plantard during the 1960s. During his visit to Jerusalem in 1898 for the dedication of the Protestant Church of the Redeemer, Kaiser Wilhelm II bought this piece of land on Mount Zion for 120,000 German Goldmark from Sultan Abdul Hamid II and presented it to the "German Association of the Holy Land" ("Deutscher Verein vom Heiligen Lande"). According to local tradition, it was on this spot, near the site of the Last Supper, that the Blessed Virgin Mary died, or at least ended her worldly existence. Both in Orthodoxy and Catholicism, as in the language of scripture, death is often called a "sleeping" - or "falling asleep" - and this gave the original monastery its name. The church itself is called Basilica of the Assumption (or Dormition). In the Catholic dogma of the Assumption of Mary, Christ's mother was taken, body and soul, to heaven. Renard delivered the designs and plans for the Abbey, the direction of construction was entrusted to the architect Theodor Sandel [de], a member of the Temple Society and a resident of Jerusalem. The foundation stone was laid on 7 October 1900. Construction was completed in only ten years; the basilica was dedicated on 10 April 1910 by the Latin Patriarch of Jerusalem. The present church is a circular building with several niches containing altars, and a choir. Two spiral staircases lead to the crypt, the site ascribed to the Dormition of the Virgin Mary, and also to the organ-loft and the gallery, from where two of the church's four towers are accessible. Out of regard for the nearby Jewish and Muslim sacred place of David's Tomb, which occupies part of the ground floor of the Cenacle, where it has traditionally been said that the Last Supper took place, the belltower is set far enough away that its shadow does not touch the tomb, and is therefore not directly accessible from the church. The first monks had already been sent to Jerusalem in 1906 from Beuron Archabbey in Germany. They were interned for the first time in 1918-1921, after the end of World War I. In 1926 the monastery was raised to the status of an abbey within the Beuron Congregation. Between 1939 and 1945, the German monks were interned for the second time, and then for the third time as the result of the 1948 Arab-Israeli War<1947-1949>. The abbey was located in the Israeli-controlled territory on mount Zion, across from the Jordanian-controlled territory within the walled city. In 1951, the abbey was separated from the Beuron Congregation and placed under the direct supervision of the Abbot-Primate of the Benedictines in Rome. The community elected its own abbot for the first time in 1979. Since 1973 the abbey has been hosting an ecumenical year of study for outstanding students of theology from Germany, Austria and Switzerland. The curriculum encompasses biblical, Eastern Orthodox Church, Judaic and Islamic studies. The Dormition Abbey, along with other Christian sites, has been the target of occasional vandalism as a form of price tag attack by extremist nationalist religious youths. In October 2012 and in May and June 2013 the abbey was vandalized with anti-Christian graffiti and insults in Hebrew. The offensive words compared Christians to monkeys and called for revenge against Jesus. Two cars were also covered with graffiti and all tyres were slashed. One of the gates of the nearby Greek Orthodox cemetery was also marked with graffiti. This was allegedly a price tag attack carried out by nationalist religious extremists for the dismantling of an illegal outpost Havat Ma'on. On 26 May 2014 a box of wooden crosses was set ablaze inside the Dormition Abbey. It is believed that this was some sort of failed arson attempt. At the same time of the arson attempt, Pope Francis was conducting a service in the building next door in the upper room of King David's Tomb. In January 2016, vandals wrote slogans on the walls of the Abbey such as "Death to the heathen Christians the enemies of Israel" and "May his name be obliterated" (whose first letters in Hebrew spell the name of Jesus). ^ Bargil Pixner, Wege des Messias und Stätten der Urkirche. 2., erweiterte Auflage. Brunnen, Giessen 1994, pp. 110f. ^ Mémoires de la Société nationale des antiquaires de France, tome XLVIII. The File Reference Number to this article in the French National Library in Paris is 8-O2F-762. ^ see e.g. Carl E. Olson, Sandra Meisel, The Da Vinci Hoax, 2004 (book and video documentary). ISBN 1-58617-034-1, and the main Priory of Sion article for details. ^ "Arson Attack Reported At Jerusalem Church Near Where Pope Celebrated Mass". The Huffington Post. 26 May 2014. Retrieved 10 September 2016. ^ "Israeli Police Arrest Jerusalem Abbey Vandal". Associated Press. 30 December 2014. ^ Nir Hasson (17 January 2016). "Jewish Extremists Vandalize Jerusalem's Dormition Abbey". Haaretz. The place where Mary ascended into heaven, according to Christian tradition. Wikimedia Commons has media related to Dormition Abbey. This page was last edited on 20 April 2019, at 22:19 (UTC).